A few weeks ago I purchased a book, Home Front to Battlefront, An Ohio Teenager in World War II, by Frank Lavin. Frank’s father Carl Lavin was from Canton, Ohio, and was a high school senior when Pearl Harbor was attacked. 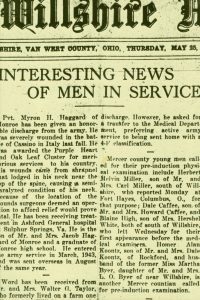 When Carl turned 18 he enlisted in the Army and eventually was part of the 84th Infantry Division, the Railspliters, and fought in the Battle of the Bulge. The book is based on Carl’s personal letters, his recollections and those of the people he served with, official military history, and private papers. This book is of special interest to me because that is almost the same WWII experience that my dad, Herbert Miller, had during the war. My dad volunteered for the draft in 1944, when he was 18 years old, and was drafted in May 1944. 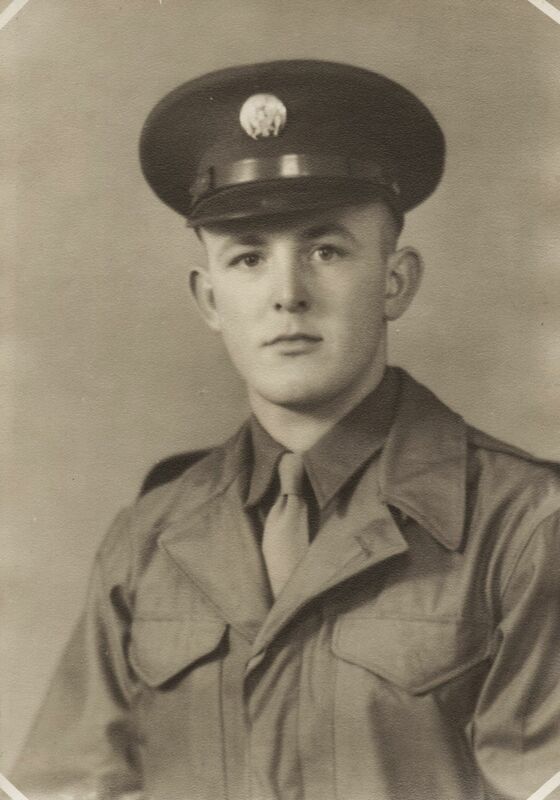 After his basic training he sailed to England and from there went to the Replacement Depot in France, where he was put in the 84th Division, 333rd Company, Infantry, on 23 December 1944. Herb Miller, U.S. Army veteran, WWII. My dad and Carl Lavin would have had very similar experiences during the war. As I read through the book I recognized the names of European towns and places that my dad had also mentioned. A large portion of the book contains transcriptions of the letters Carl wrote and sent home during the war. Likewise, my grandparents saved many of the letters my dad wrote and sent home during that same time. We found a large stack of those letters among my dad’s papers last year. I was thrilled and thankful that they had saved them after all this time. I have sorted through the letters, put them in chronological order, and inserted them in sheet protectors. They fill at least 3 3-ring binders. The Lavin book has given me the inspiration to do something similar—to transcribe my dad’s letters and put some of them in blog posts. With Veterans Day less than a month away I thought this would be a good time to start the project. My dad said he volunteered for the draft mainly because he wanted to go into the Army with his friend Donald Hoblet. The Willshire Herald, 25 May 1944. 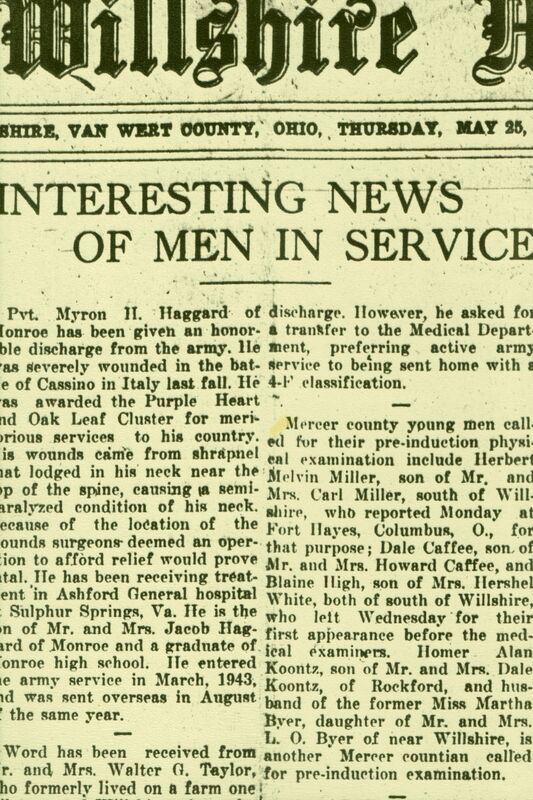 Mercer county young men called for their pre-induction physical examination include Herbert Melvin Miller, son of Mr. and Mrs. Carl Miller, south of Willshire, who reported Monday at Fort Hayes, Columbus, O., for that purpose; Dale Caffee, son of Mr. and Mrs. Howard Caffee, and Blaine High, son of Mrs. Hershel White, both of south of Willshire, who left Wednesday for their first appearance before the medical examiners. Homer Alan Koontz, son of Mr. and Mrs. Dale Koontz, of Rockford, and husband of the former Miss Martha Byer, daughter of Mr. and Mrs. L.O. Byer of near Willshire, is another Mercer countian called for pre-induction examination. My dad spent 2 days at Fort Hays in Columbus. 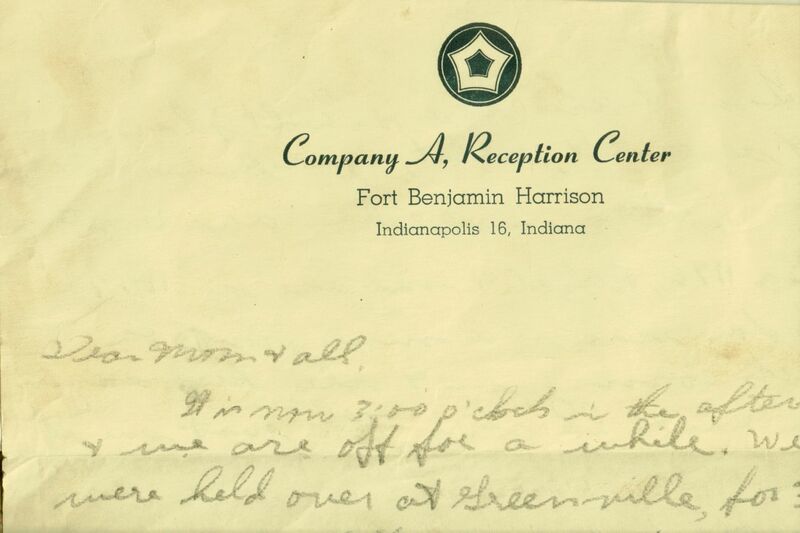 He then spent a week at Fort Benjamin Harrison, Indianapolis, Indiana. These two letters are from his time spent there. The first letter indicates that he was inducted with some other friends from the area. 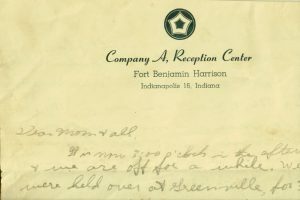 Letter postmarked 30 June 1944, 9:00 a.m., Indianapolis, Indiana. There was no postage stamp. Instead FREE was written in place of a stamp. It is now 3 o’clock in the afternoon and we are off for awhile. We were held over at Greenville for 3 hours 48 minutes and hold over at Indianapolis for 15 minutes. We had another phys exam last night and today were sworn in and inducted today. We are waiting to get our uniforms. We will get 2 winter uniforms, 2 sun tan uniforms, 1 fatigue, 1 helmet, and 2 or 3 overseas hats. Tonight Betzel and me are going to a show. Do not write as we are only being held here while we are processing and will be sent somewhere else, so don’t write until I get situated at another camp. It may be anywhere from 10-20 days before we leave here. The eats are good and this is a swell [?] place. We got separated, Hoblet, Case, Brehm, Betzel, and me. Hoblet and Case and Brehm are together in Roster 1176, Betzel and me are in 1177. Each day there is a new group of recruits coming in and they keep saying to them “you’ll be sorry.” They just say it for fun. Roster 1176 has their uniforms already. Betzel is writing to his folks, too. We haven’t had any work to do yet. Now about processing, it is something [?] so you can get acquainted with military terms and things. Must hurry. Our number was just read to get uniforms, so will close. 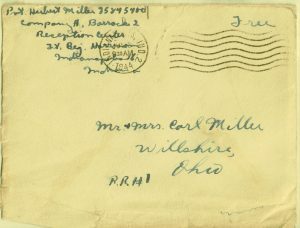 Letter postmarked 5 July 1944, Indianapolis, Indiana. 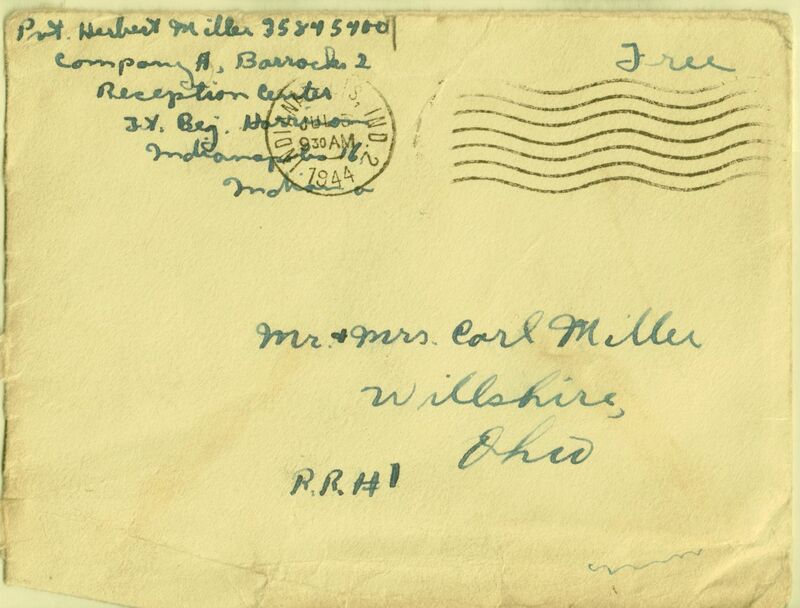 Addressed to Mr. & Mrs. Carl Miller, RR #1, Willshire, Ohio. This is the fourth of July. I’m not on K.P. today or any detail today so I am staying in my bunk in case they call for me to “dive-bomb.” That means to walk around looking for cigarette butts and matches. You see we have a loud speaker system in every barrack and they call over it “all men not processing or on Detail work fall out between A-2 & A-3,” and that includes me if there is any odds or ends. This kind of work is trimming hedges, watering the grass with garden hose, or mowing the lawn. It doesn’t take over 2 hrs in the morning and about 2 in the afternoon and [?]. What are you all doing over the fourth of July? Well they gave the call and it took 15 minutes as I was off for the rest of the morning. Me and pvt[?] Knapke went to the recreation hall and listened to the music. He is from Minster, Ohio, and went the same day we did. The boy from Pittsburgh, Pa I was telling you about shipped out today. I have some clothes to wash today. A towel, 2 sets of underwear, & handkerchiefs. General Summerville[?] is coming out here at camp today so everything is being scrubbed and cleaned. We have plenty of ice cream, pop, candy, and [?] to eat. It cost quite a lot, but it is cheaper than back home. Now I don’t mean I’m running out of money because I‘ve only spent a couple of $. They brought a bunch of men in from camp Atterbury last night around 3 o’clock. Well it is about time for chow. I wrote to Em & Norval this morning and also Johnnies. I’m not going to write very many letters until I get situated because the mail I would receive might get lost. 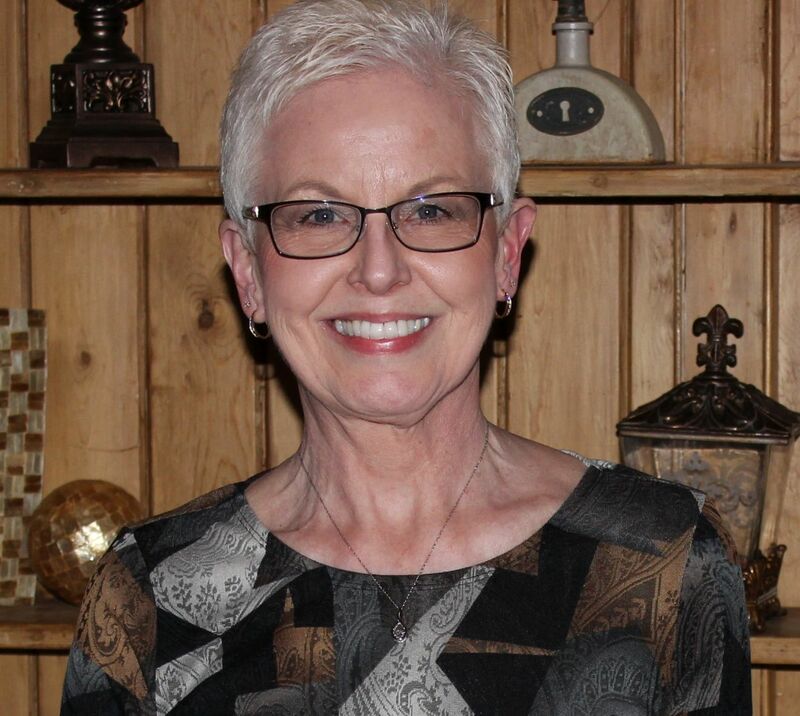 Got my pictures today from the photo shop so am sending them to you. You can send Ruth & Bob one if you wish. They aren’t very good. Has it rained out there lately? How are the crops coming along? Johnnies wrote and said you got my tire for the Chevy. Was it a first grade tire? Have you had any trouble with the car? Well must close or miss dinner. P.S. Don’t forget to check the water in the car.